A pretty floral invitation for a First Birthday Party in shades of lovely pinks and purple. We’ll customise this watercolour party invitation further with your party information. We’ll email to you the final jpeg version of the invitation so that you can print off as many party invites as you need. 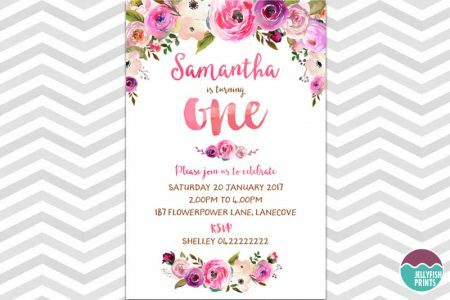 Gorgeous water colour flowers and leaves make up this delightful birthday party invitation. It will suit a First Birthday, Baby shower, Sweet 16th and bridal party celebration. 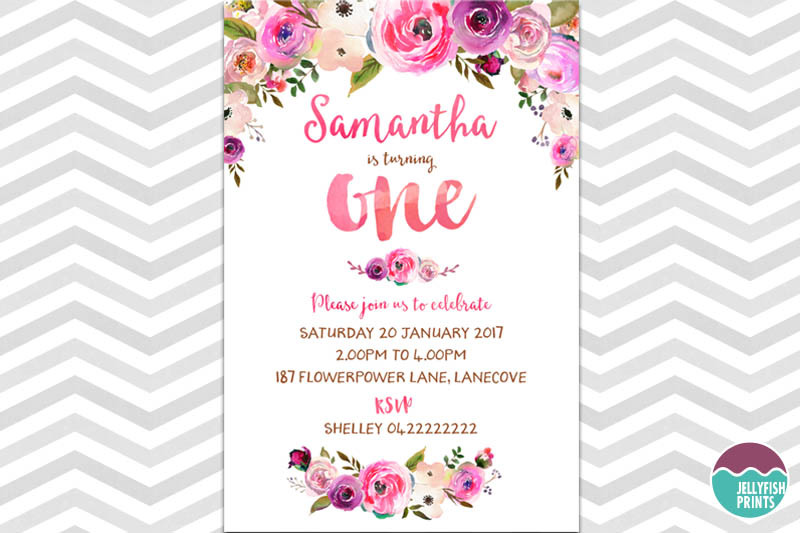 You are welcome to customise your party invitation. If you would like to change the flower colours of this invitation we may be able to do that for you. Certainly all the text is changeable and you are welcome to make any textual changes as required. We can also create a photo invitation with this design. Just let me know if you wish to include a photo of the birthday guest of honour and we can do that for you. We will email your invitation in your chosen file format (jpeg or pdf) within 2 Business days.